The 2016 Zip Trip season has begun and the first stop was Arlington on June 23rd! We met some great people, gave away a bunch of great prizes and had a lot of fun! Arlington is a great place for raising a family and all you need to know about living here is below! If Arlington, MA was a person in a high school yearbook, it would earn the title of “Most Likely to Earn Best Suburban/Urban Living”. Sandwiched between Cambridge and Lexington, it is has the feel of a suburban town, but is just minutes outside the city. Just a quick bus ride connects commuters to MBTA Train stations. A quiet, family focused town creates a peaceful place to raise a family. The average home value in Arlington is $743,000 for a single family residence. Arlington Public High School is ranked 16th in the state. The schools along with easy access to the city, beautiful parks, and historic landmarks, make Arlington a great place to raise a family. The town of Arlington was settled by European colonists in 1635. The name “Arlington” was chosen in 1867 in honor of those buried in Arlington National Cemetery. 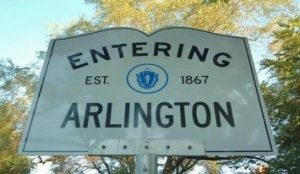 Before “Arlington” was chosen, the town was named “Menotomy”, a city in which Paul Revere’s famous midnight ride went through. On the first day of the American Revolution, more blood was shed in Arlington than the battles of Lexington and Concord combined. A stream called “Mill Brook” flows through the town; this historically factored into Arlington’s economy. The first mill in this area was built by Captain George Cooke in 1637, making it the longest working mill in the country. Arlington is also home to the famous Uncle Sam. Samuel Wilson was born in Arlington in 1766 and is noted for his career role during the War of 1812. He was appointed mean inspector for the Northern Army and his duties included checking the freshness of meat and assuring that it was properly packaged. There is a monument marking his birthplace in Arlington. is also home to the Mystic Lakes, consisting of Upper Mystic Lake and Lower Mystic Lake. The lakes were previously part of the drinking water supply for Charlestown and later Boston. Lower Mystic Lake is a meromictic lake, meaning that it has a deep layer of water that rarely mixes with its top waters. This means that the sediments at the bottom, accumulate in annual layers that have been undisturbed for thousands of years. These lakes drain south which empties into the Mystic River and eventually Boston Harbor. If you enjoy fishing, Spy Pond is a great place to drop a line, located along the Minuteman Bikeway. The city’s public school system is highly rated year after year and contains seven elementary schools, one middle school, and one high school which is currently ranked 16th in the state. Arlington is also home to Parochial schools, two private elementary/middle school, two secular elementary schools, and Arlington Catholic, a private high school. Arlington is also in the district served by the Minuteman Regional High school, which is one of the top vocational-technical schools in Massachusetts. In Arlington, there is plenty to do to stay busy. Robbins Farm Park has been a long time, top destination for parkgoers in Arlington. 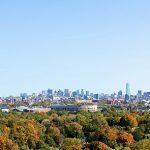 Combined with a spectacular view of the Boston skyline, baseball field, soccer field, playground, and a pair of 50-foot downhill slides, there’s something for every age to enjoy. In the summer they even have movie nights and concerts. Arlington is also home to many eclectic restaurants, such as La Victoria Taqueria, Blue Ribbon BBQ, Sono Asian, Sabzi, Pasha, Woori, and Za. 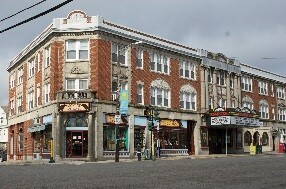 Arlington is home to the historic Capitol Theater, which is a great place to see a movie. The Jefferson Cutter House is located at 1 Whittemore Park, and was originally home to Jefferson Cutter who was born in Arlington. This is a historic gem and is in fact listed on the National Register of Historic Places and Houses. Future job growth is predicted to be 39.10% over the next ten years. The unemployment rate in Arlington is 3.60%, with a job growth of 1.33%. The top occupations by population are management/business/finance, engineering/computers/science, and community/social services. 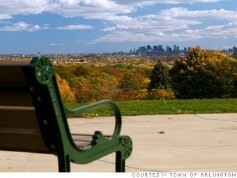 Being so close to the city also opens up plenty of Boston employment opportunities.